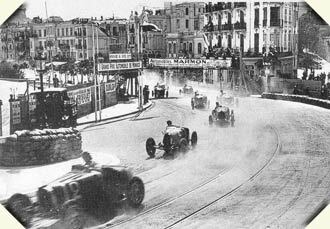 The first Monaco Grand Prix was held in 1929. Pole sitter Williams leads the field away in a Bugatti 35B. The race would be won by a young Frenchman called Philippe Etancelin. 21 years later Etancelin would race the opening world championship season in a Lago-Talbot. Louis Chiron tip toes one of the mighty pre-war Mercedes-Benz W25 along the return leg behind the pits where today the swimming pool resides. 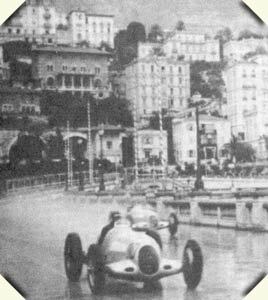 This wet day in Monaco would see his team mate Rudolf Caracciola win, although Chiron did claim pole position. 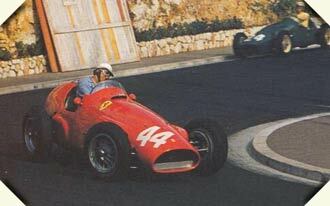 Luigi Villoresi in the Ferrari 125 at the first world championship Monaco Grand Prix. Villoresi would be the last car to retire, with a broken rear axle. But team mate Alberto Ascari had finished second. Alfa Romeo knew they had an oponent. After the Mercedes of Juan Manuel Fangio and Stirling Moss retired, and Alberto Ascari crashed his Lancia D50 into the harbour, that left the little frenchman Maurice Trintignant in the Ferrari 625 to grab a fortuious win. 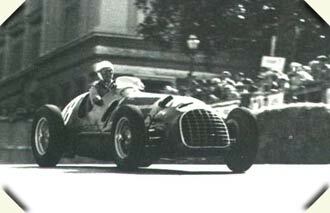 Ferrari were at low ebb in 1955 being outclassed by Mercedes, Lancia and Maserati. 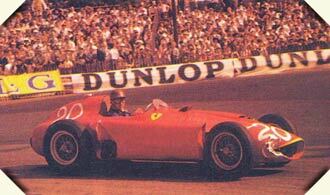 Juan Manuel Fangio in the Ferrari in 1956. The '56 Ferrari was really a Lancia D50, the Scuderia having taken over the Lancia operation after the money and enthusiasm had started to run dry after the death of Lancia lead driver Alberto Ascari. Fangio started in this car but after damaging the car against one of Monaco's ever present solid object hazards, retired it and took over Peter Collins car to salvage second place on a day when nobody would touch Stirling Moss in the Maserati 250F. High above the Gasworks in the approximate area where a corner would later be named for the Monaco Grand Prix's founder Antony Noghes, Jean Behra in the Ferrari Dino 246 leads the two Rob Walker run Cooper T51 Climax's of Stirling Moss and Maurice Trintignant. Out wide is eventual winner Jack Brabham in the factory Cooper T51 Climax, looking like it might be swllowed by the cavernous intake of Phil Hill's Ferrari 246. This corner is now roughly where the swimming pool section ends, and where pit lane entry begins. 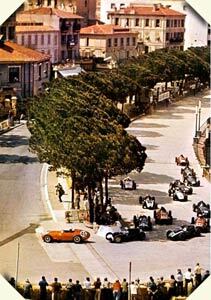 The Monaco pits, 1961 style. 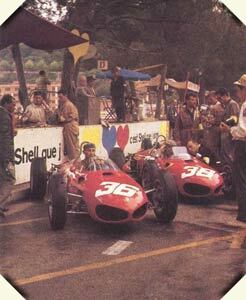 The wonderful shark nosed Ferrari 156's of Richie Ginther and Phil Hill stand ready for battle. Everyone expected a firece battle for the win amongst the scarlet cars. The Ferrari's fought hard but despite their horsepower advantage, were beaten by a superior Stirling Moss in his Rob Walker run Lotus 18 Climax. Jim Clark descends through Lowes in the Lotus 25 Climax while a photographer shoots a shot unable to be taken today. 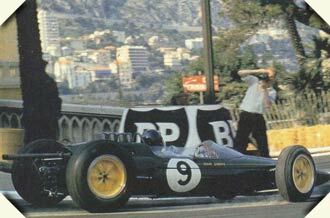 Clark would never win Monaco, and this day crashed in the one of only two races he didn't finish all year. 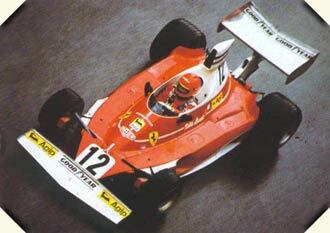 Eight wins would give Clark in 63 the only perfect score ever achieved in Formula One. 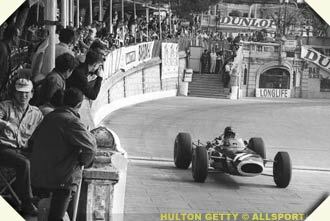 The crowd lean close as the Master of Monaco, five times winner here, Graham Hill, sweeps through Tabac in the BRM 261. In response to the new three litre regs BRM were developing a new H16 engine consisting of two 1.5 litre V8's together. While the complex new engine was prepared though BRM would use the two litre engines they used in the Australia & New Zealand Tasman Cup spec cars. It was down on power but enough for BRm's developing young driver Jackie Stewart to win after John Surtees Ferrari retired. Hill would finish third. 1967 This day, this race, would see the start of Formula One's realisation that safety of the drivers was an important issue. While Jackie Stewart began his own campaign the previous year after his crash at Spa, it was the shocking crash of Lorenzo Bandini in 1967 that got Formula One as a whole thinking on the topic seriously. While chasing Denny Hulme late in the race, Bandini's Ferrari 312 clipped a hay bale, rolled over and burst into flames. Bandini succumbed to the burns he received, and other injuries, three days later. 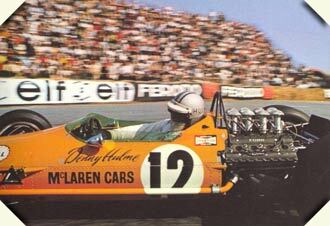 Denny Hulme in the McLaren M7A Cosworth. In the 50's and 60's there was very little in the way of protection for cars headed for the harbour. Even in the late 60's the trip into the water was protected by bollards and hay bales rather than armco. From the moment Ken Tyrrell started building his own cars they were race winners. 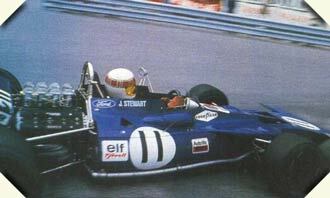 Here Jackie Stewart is on his way to winning the 1971 Monaco Grand Prix aboard his Tyrrell 003 Cosworth. The new era for Ferrari had begun. The old 312B series had run out of potential, and the new 312T series cars were beautfilly balanced with a bullet proof reliable boxer 12 Ferrari engine. 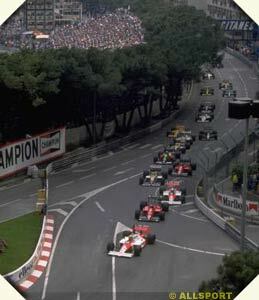 In the wetof Monaco Niki Lauda races to win his first win of the year that would lead to his first world title. 1984 When it rains you occasionally see a great drive rise above the conditions, and the abilities of their car and see them shine like a diamond. In the abysmally bad conditions Ayrton Senna in the Toleman TG184 Hart remorslessly hunted down Alain Prost in the far superior McLaren. And on the very lap race director, Jacky Ickx decided enough was enough and the race had to be red-flagged, Senna took the lead. However after a ed flag the results are back trapped a lap, thus losing him his first Grand Prix win. Strangely enough the 4.5 points Prost won for a shortened win were less than the 6 points for a second if thy race had been let go. And Prost lost the world championship to Lauda by half a point. Ayrton Senna (McLaren MP4-4 Honda) leads the pack away from the grid, into Ste Devote before the climb up the hill. In second is the Ferrari F187/88C of Gerhard Berger ahead of Alain Prost in the second McLaren, Nigel Mansell in the Williams FW12 Judd, Michele Alboreto in the second Ferrari, Alessandro Nannini in the Benetton B188 Cosworth and the second Williams of Riccardo Patrese. McLaren raced of into the distance giving a win to Prost, while Berger beat Alboreto for second. 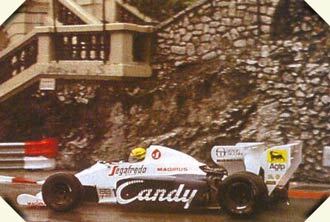 Senna had the race in the bag when a momentary error put him into the barriers. A superb study of Nigel Mansell at Tabac Corner in the Williams FW14 Renault. Mansell was a close second to Ayrton Senna. 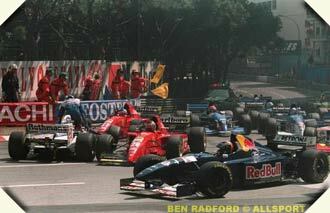 Mansell would be second again to Senna in 1992 in an even closer battle. 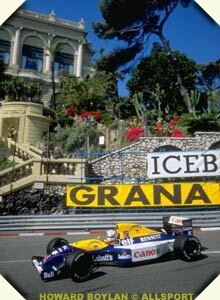 Mansell would not race here again after that during the course of retirements and comebacks. One of the few race the brit never won. 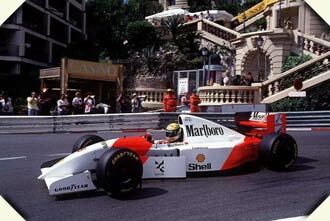 Ayrton Senna on his way to win sixth Monaco Grand Prix in the McLaren MP4/8 Cosworth. Senna's record at Monaco was remarkable, better than even Graham Hill's with only small slivers ill fortune not allowing him to take two more wins. 1994 Just two weeks after the deaths of Ayrton Senna and Roland Ratzenberger, another Formula One driver's live hung in the balance. 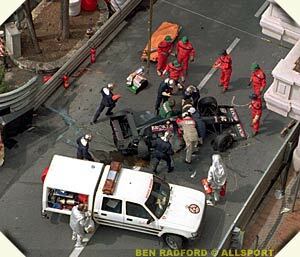 Austrian Karl Wendlinger had a high speed crash at the harbour front chicane in his Sauber C13 Mercedes. it was this accident almost as much as those at Imola forced much improved safety measures on Formula One, with several circuits being chicaned out of character. After spending several days in a coma, Wendlinger recovered fully and returned to F1, but the potential speed he once promised was no longer there. The race has been stopped and Damon Hill abandons his Williams FW17 Renault. Crowding the Williams are the Ferrari 412T2of Gerhard Berger and Jean Alesi and the Pacific PR02 Cosworth of Andrea Montermini just behind. While in front Heinz-Harald Frentzen in the Sauber C14 Ford looks around with visor open as if to say what now? 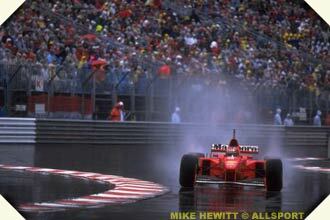 1997 Michael Schumacher (Ferrari F310B) splashes his way towards a comfortable win in the 1997 Monaco race over Rubens Barrichello's Stewart. The harbour front area has changed substantially, from the tram tracks of the 30's, to the concrete paving of the 60's, to todays armco, concrete and tarmac look. Mark Alan Jones © 2000 Kaizar.Com, Incorporated.